Although this isn’t a very technical job, it does call for lot of patience. 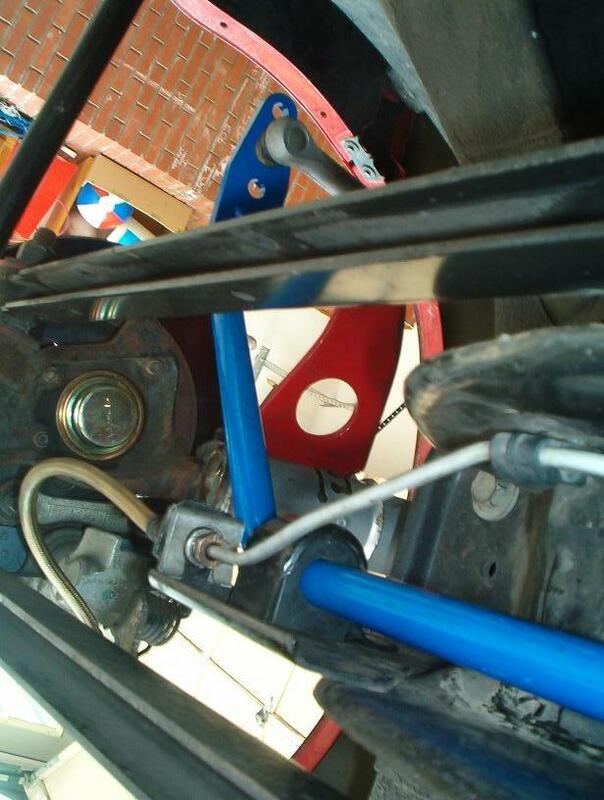 I made the mistake of getting under the car and thinking I could do it without detaching the spindle and shock…….Big mistake….Ended up wasting a lot of time messing with it!! Because the #34 isn’t exactly a “stock” Saturn, parts of the instructions may not be applicable, but overall, it will get you in the right direction. 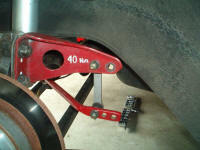 3) Disconnect the old sway bar at the strut and unbolt the brackets that mount it to the rear beam. There is a bolt at the top of the bracket (13mm) but a tab at the bottom. It takes some messing around to get the tab out of the slot. Be careful of the brake lines. 5) Disconnect the brake lines on both sides at the bracket that holds them to the rear beam. After you have a couple of teaspoons of brake fluid run down your arm, get some paper towels and put them on the floor under the connection. 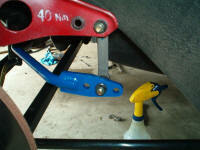 6) I ended up pulling off one of the calipers. 7) I had maxed out the height of my jack, so I put a 2x4 on it to get it high enough to thread the old bar out and thread the new one in. 8) Make sure the new bar goes on top of the break lines. 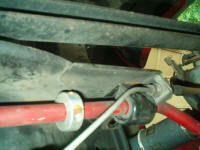 9) Bolt the spindle, shock and caliper back up. 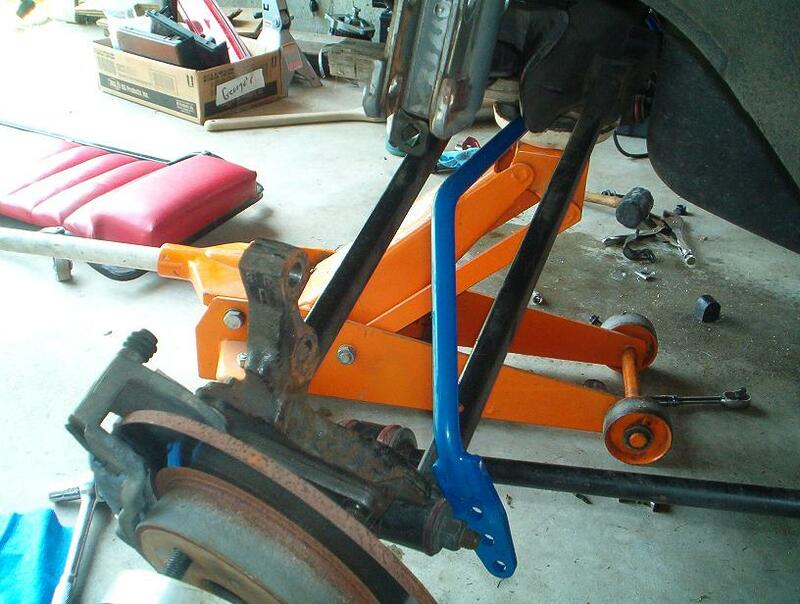 10) Loosely bolt the new sway bar in. If going from a stock sway bar, I would recommend using the softest setting to start with (hole farthest from the bend). 11) Reconnect the brake lines. 12) Make sure the new bar is even side to side. 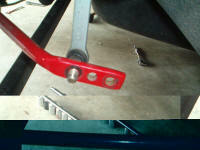 After installing the new 17.5 mm sway bar on our ITA Saturn, we took it out for a test day at Lime Rock Park in the CT. Initially, we had positioned the bar at the middle setting figuring this would be a good place to start. The first couple of sessions I had severe and sudden over steer on corner exit, making the sessions very “interesting” from a driver’s stand point. Considering this is a low-powered front wheel drive car, by time you are apexing you have the gas pedal to the floor. So, using the throttle to make it stick wasn’t an option. Not wanting to back off on the bar, we played with the alignment to get the back to bite a little more. In qualifying for the next race, the car was still oversteering more than I would have liked. Not feeling comfortable, I ended up only qualifying 6th (out of 23 other ITA cars) and for the race, I chickened out and set the bar to its softest setting. The car did push (but it was safe and that’s what I was looking for during the race). Unfortunately the race ended up lasting only four laps due to a bad accident. For the next race I decided to go back to the middle setting and back off on the rear shock compression. As I was fiddling with it, I realized the bar was binding in the bushings, which may have been a contributing factor to the “no warning” snap over steer. I had (foolishly) tried to drill out the bushings from the 16mm bar and it obviously didn’t work. With the proper bushings in place, the bar moved freely. So, the great new set-up was scrapped for a rain set-up, disconnect rear sway bar, tighten front compression all the way. Although I got a good start and seemed to be in the hunt, I managed to throw the accessory belt on about lap three and had to park it.